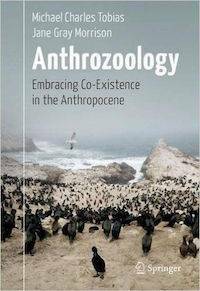 This groundbreaking work of both theoretical and experiential thought by two leading ecological philosophers and animal liberation scientists ventures into a new frontier of applied ethical anthrozoological studies. Through lean and elegant text, readers will learn that human interconnections with other species and ecosystems are severely endangered precisely because we lack — by our evolutionary self-confidence — the very coherence that is everywhere around us abundantly demonstrated. What our species has deemed to be superior is, according to Tobias and Morrison, the cumulative result of a tragically tenuous argument predicated on the brink of our species’ self-destruction, giving rise to a most unique proposition: We either recognize the miracle of other sentient intelligence, sophistication, and genius, or risk enshrining the shortest lived epitaph of any known vertebrate in earth’s 4.1 billion years of life. Tobias and Morrison draw on 45 years of research in fields ranging from ecological anthropology, animal protection and comparative ethics to literature and spirituality - and beyond. They deploy research in animal and plant behavior, biocultural heritage contexts from every continent and they bring to bear a deeply metaphysical array of perspectives that set this book apart from any other. The book departs from most work in such fields as animal rights, ecological aesthetics, comparative ethology or traditional animal and plant behaviorist work, and yet it speaks to readers with an interest in those fields. A deeply provocative book of philosophical premises and hypotheses from two of the world’s most influential ecological philosophers, this text is likely to stir uneasiness and debate for many decades to come.